This post contains affiliate links, meaning, if you click through and make a purchase or sign up for a program, I may earn small commission. This is at no additional cost to you. Traveling to Germany for the First Time? 1 Traveling to Germany for the First Time? 3 What’s the Best Time to Go to Germany? 4 What’s the Cheapest Time to Fly to Germany? 5 What’s the Weather in Germany Like? 6 What time is it in Germany right now? Germany is a wonderful country to visit and an easy place to travel. I lived there for 4+ years and have spent nearly 30 years of my life going back and forth between the US and Germany (I was also a German teacher for several years and have a PhD in the extremely useful field of German Applied Linguistics 😀). More importantly, I’ve not only traveled all over the country, I’ve lived in several German cities in several regions of the country. All this to say, I love sharing what I’ve learned over the years and helping people plan amazing trips to Germany! If you’re traveling to Germany for the first time you probably don’t know where to even begin to narrow down your travel options. 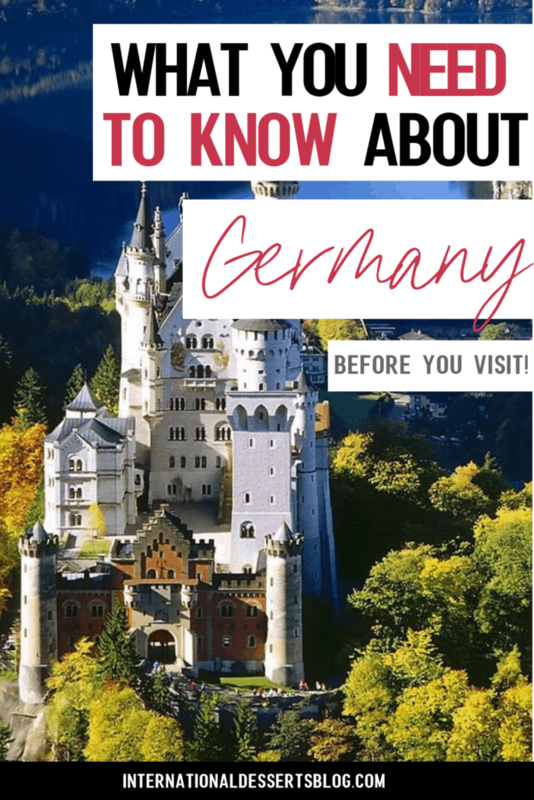 This guide will help you prepare for your visit to Germany, show you how to travel in Germany, and make your first time in Germany everything you want it to be. If you have any questions about Germany travel, feel free to ask me here. If you have dreams about traveling to another country, Germany is a great place to go. There’s much to see and experience in every season! Cities, villages, mountains, spas, castles, lakes, hiking trails, beaches, wine, beer, delicious food…Germany has it all. Speaking of food, no matter how you prefer to eat – vegetarian, vegan, organic, gluten free, dairy free, paleo, keto, etc – you’ll never go hungry in Germany. 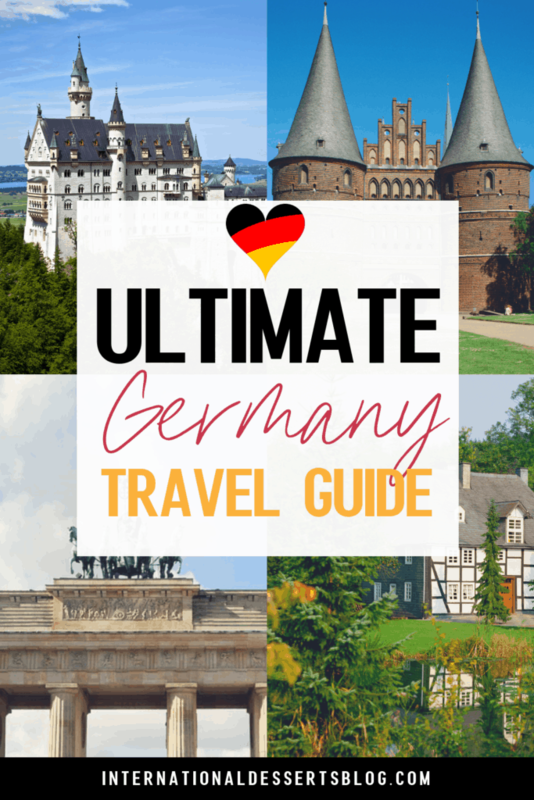 It’s super easy to get around Germany by air, train, car, bus, bike or foot. First time traveling alone? Have anxiety about traveling alone? Wondering how safe is Germany? Rest assured, solo travel in Germany is safe, easy, and fun! I’ve always felt safe in Germany, even before I could speak German, and have traveled all over the country alone many, many, many times. Most Germans speak at least a little English (many young people are pretty fluent), as well as other languages, so communication shouldn’t be too much of a problem. Want to learn German in Germany? No problem! I highly recommend the Goethe Institute (and I’m not getting paid or sponsored in any way to say that). I once received a scholarship to study in Murnau (near Munich) and loved my time at the Goethe Institute. Centrally located in Europe, it’s super easy to start your trip in Germany and then visit other countries in Europe. 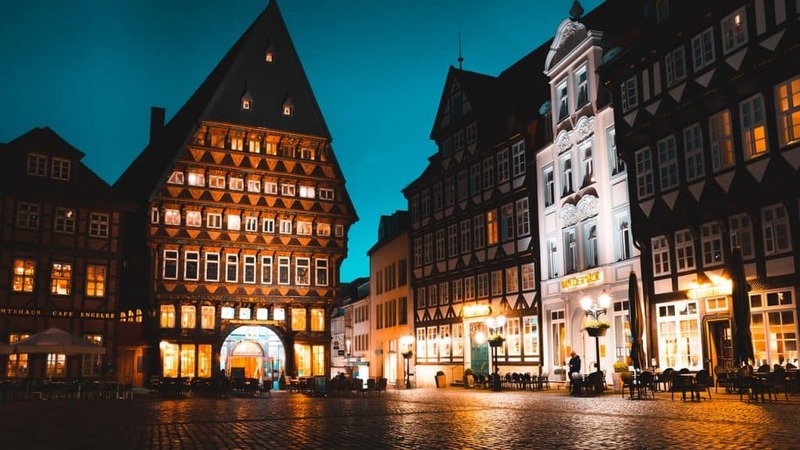 No matter what kind of trip theme you prefer – romantic, adventure, family, music, art, food, history, outdoors, to name a few – you’ll find lots of options in Germany. Germany has the BEST bakeries (the bread!! ), cafes, bars, and Biergärten. Not to mention all of the to-die-for desserts! What’s the Best Time to Go to Germany? The best time to visit Germany is whenever you can get there! There’s no best time of year for your Deutschland tour because there’s no bad time of year to visit. I’ve traveled all over Germany in spring, summer, fall, and winter and enjoyed every single season. Summer is when you’re most likely to have warm (even hot) sunny weather. But it’s not guaranteed. I’ve had hot steamy summers in Germany, cold rainy summers, and everything in-between. Fortunately, even if you encounter rain in the summer it likely won’t last more than a few hours or at most a few days before you’ll see the sun again. The benefit of summer travel is that you’ll have nice long days for sight-seeing. If you’re interested in beaches or mountains, summer is a great time of year to visit. Note, however, that not all hotels, cars, and restaurants use A/C. If you really hate hot weather, play it safe and avoid Germany in the middle of the summer. (Although, to be honest, there have only been a few days in the summer that I’ve found truly unbearable without A/C.) If you must have A/C in your hotel or car, be sure to confirm that your room or car has it. Summer can also be a more crowded time to travel, since so many families make use of summer break. Book accommodation early for the most options and best prices! Winter travel in Germany can be cold but beautiful. One of my favorite times of year to travel in Germany is during the four weeks of advent at Christmas. Yes, it gets dark early but the lights, decorations, and Christmas markets more than make up for it. Plus, you can go skiing and enjoy other winter activities. Germans don’t let winter keep them from enjoying outdoor activities, even if that’s just strolling through a Christmas market or window shopping on a Sunday. Don’t let it stop you, either! Just bundle up, grab a mug of Glühwein, and you’ll be fine! Fall and spring are also great times to visit Germany. In the fall you’ll enjoy crisp mornings and cool evenings and seeing the leaves change color. In the spring you’ll experience the joy everyone feels when they can once again sit outside at cafes and restaurants. The weather can vary quite a bit day to day but if you travel late in the fall or early in the spring you can score great deals and will find smaller crowds. What’s the Cheapest Time to Fly to Germany? The least expensive time to fly to Germany is usually during the off season or shoulder season. Summer and Christmas can be much more expensive. That said, I’ve found great deals even at that time of year (I always track flights through google before I buy my ticket). If you plan to use miles, look at your options several months in advance so you have the most options. I regularly fly to and from Europe using miles only paying for taxes, even in the summer. My tips: book your flights several months in advance and look at flying into or out of smaller regional airports (Berlin, Hamburg, Stuttgart, Munich, Düsseldorf, etc). I just booked flights for my husband and I for mid-June and couldn’t find anything into Frankfurt using miles but I did find flights into Berlin and out of Stuttgart. Click here to check out the best flight deals! What’s the Weather in Germany Like? What will the weather be like when you visit Germany? Well, it depends on the time of year and where you are. Weather in Germany can be unpredictable no matter the time of year. I recommend being prepared by wearing layers, packing an umbrella or rain jacket, and remembering that the weather will likely change soon. Summer. Germany comes alive in the summer with everyone and their dog (literally, there are dogs everywhere) outside enjoying the nice weather. Average high in the summer is 80F. Be warned…it can rain in the summer but it doesn’t usually last that long. It can also be super hot in the summer…but again, scorching temperatures doesn’t usually last that long. Fall. Such a beautiful time of year in Germany with the leaves changing colors and cool, crips mornings and evenings. One of my favorite times of year in Germany! In September, the average high is 67F and by November it’s around 47F. Winter. Bring your scarf, hat, and mittens because German winters can get cold! Average temps hover around freezing. 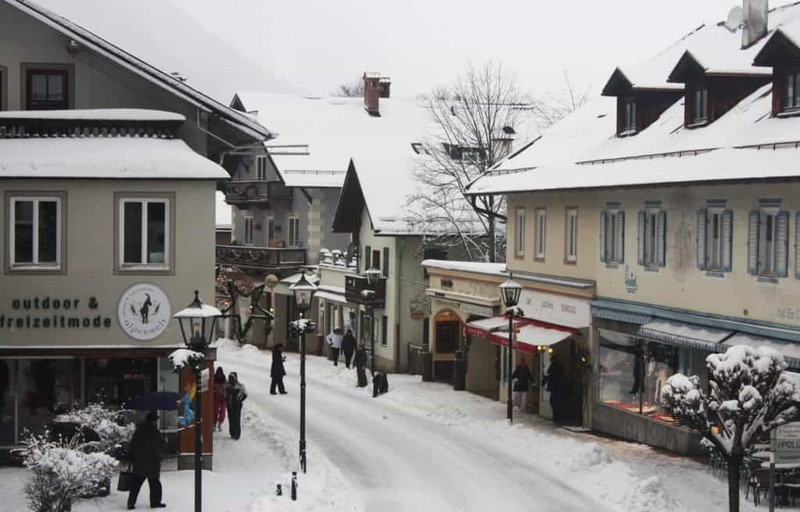 While it can snow anywhere in Germany, you’ll find the most snow in southern Germany. Winter weather doesn’t mean everyone hides inside, though. On the contrary! Do what the Germans do – bundle up and enjoy the outdoors. Spring. I love being in Germany on the first spring day because everyone heads outside to enjoy the sun. Everyone is in such a good mood! Early spring will see a high around 47F but by late spring it’s more like 67F. What time is it in Germany right now? Germany is in the Central European Time zone (CET) or UTC+2. It’s 6 hours ahead of the US EST, 7 hours ahead of CST, 8 hours ahead of MST, and 9 hours ahead of PST. Daylight savings in Germany 2019: time “falls back” on October 27, 2019 and “springs forward” on March 31, 2019. Note these dates in your calendar so you don’t accidentally miss any flights or trains! It’s easy to get to Germany! 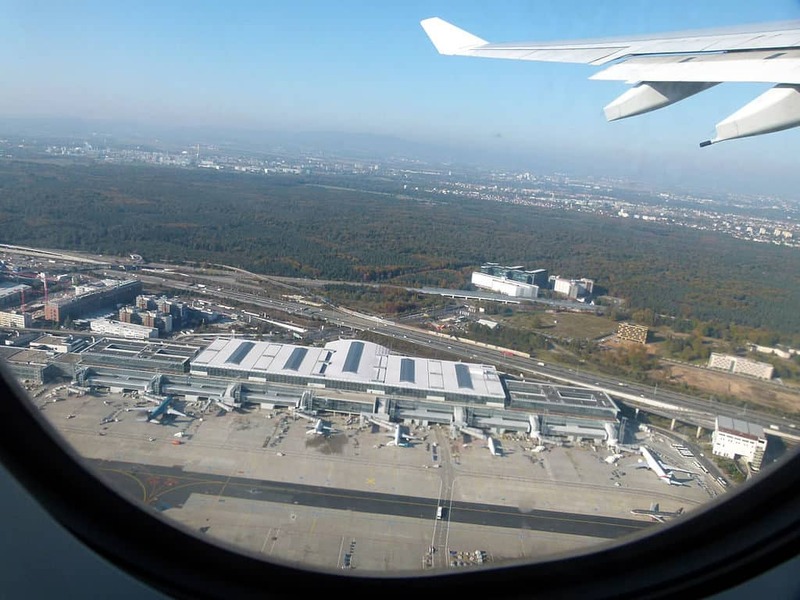 Many people fly to Frankfurt, one of the largest and busiest airports in Europe, and then take a commuter flight, train, bus or rental car to their final destination. There’s a train station right in the Frankfurt airport (right below Terminal 1), so transferring from plane to train is a breeze. You’ll find cheaper train ticket prices if you book ahead of time online (I always book through the official Deutsche Bahn website and print out my tickets before flying to Germany). If you book your train in advance, be sure to book it for at least a few hours after you’re supposed to arrive. Getting through passport control, customs, picking up your checked luggage, and making your way to the train station can take longer than you think. And if your plane is delayed…well, it’s easy to miss your train and have to buy a new ticket on the spot. For ultimate flexibility and peace of mind, spend the night in Frankfurt and book your train for early the next morning. You can also easily pick up a rental car at the Frankfurt airport. My husband and I have done this a few times and never had any problems. The one problem we do have? Staying awake long enough to drive to our destination! I usually try to keep the driving distance to under 3 hours on the day of our arrival. A few times we’ve had to pull over at a rest area or park, push the seats back, and take a nap because neither of us could keep our eyes open! If you need to catch a bus from the city center to travel onwards, S-bahn 8 or 9 will zip you into town quickly and cheaply in about 10 minutes. Buy tickets at any of the ticket machines before you board the S-bahn. You can also catch busses into Frankfurt and elsewhere in front of Terminal 1 (arrivals level) and Terminal 2 (level 2). You’ll find taxis in the same general area. It takes about 20 minutes to go downtown by taxi. I used to always fly into Frankfurt and then take a train or rental car to my final destination. But recently I’ve found that it’s often easier (and sometimes actually costs less) to fly directly into other cities – Munich, Hamburg, Berlin, Düsseldorf or Stuttgart, for example – when booking my international flight. As I mentioned earlier, for my upcoming summer trip I opted to fly into Berlin and out of Stuttgart because I could use fewer miles than flying in and out of Frankfurt! Plus, I love the smaller airports because it’s just so much quicker and easier to get to my rental car (or the train) and I’m often closer to my final destination than if I were starting in Frankfurt. Sometimes you can get direct flights into these regional airports from the US; other times you’ll connect via another European city, such as London, Amsterdam, Vienna, Stockholm or Reykjavik. We’re flying into Stockholm before Berlin this year, and from Stuttgart to Vienna on our way back to the US. Tip: depending on the airline you fly, you might be able to arrange a free stopover in your connecting city! I used to do stopovers in London, and a couple years ago I did an awesome 48-hour stopover in Reykjavik, Iceland! I usually fly to Germany with miles but if I ever have to pay for a flight again I’m going to look into flying with TAP so I can do a stopover in Lisbon or Porto. 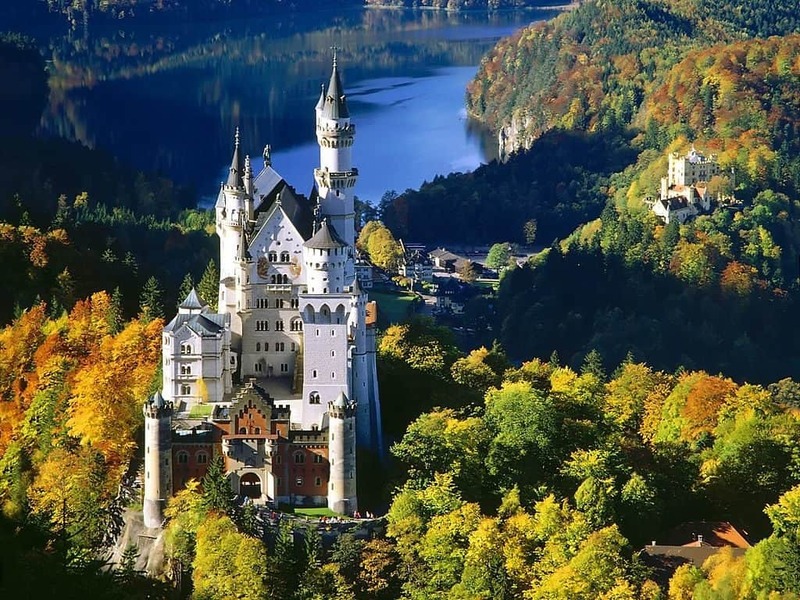 Click here to check out the best deals on flights to Germany! One of the benefits of traveling in Germany is that it’s super easy to get around the entire country. You have so many transportation options! You can rent a car and drive from city to city. Or you can stick to trains and busses. I’ve done both; if I’m primarily visiting big cities I prefer taking the train or a bus to get from one city to another. When I spend more time in smaller cities or want to take day trips, I prefer having a car. For my upcoming trip to Germany, we’re renting a car at the Berlin airport and returning it to the Stuttgart airport. For this trip, we don’t plan to take trains or busses at all. We’re getting a car so we can go to places that aren’t as easily (or quickly) accessible by train. We don’t plan to use the car every day, though. While we’re in larger towns we’ll walk, rent bikes or use public transportation. Speaking of public transportation, Germany’s is one of the best! It’s super easy to get everywhere you want to go via the S-bahn (above ground metro), U-bahn (underground metro), Strassenbahn (street car), and bus. Taxis (and Uber/Lyft, where available) are also convenient options, though pricer than public transport. There are also car-share programs that you can look into. I haven’t used any of them and don’t know how convenient they are for travelers but it doesn’t hurt to check them out. German cities are very walkable, so it’s easy to get around by foot. And, if you’d like to bike around like a local, there are lots of places to rent bikes around town or maybe even at your hotel or AirBnB. If you’re more interested in just one afternoon of biking, try a city bike tour! 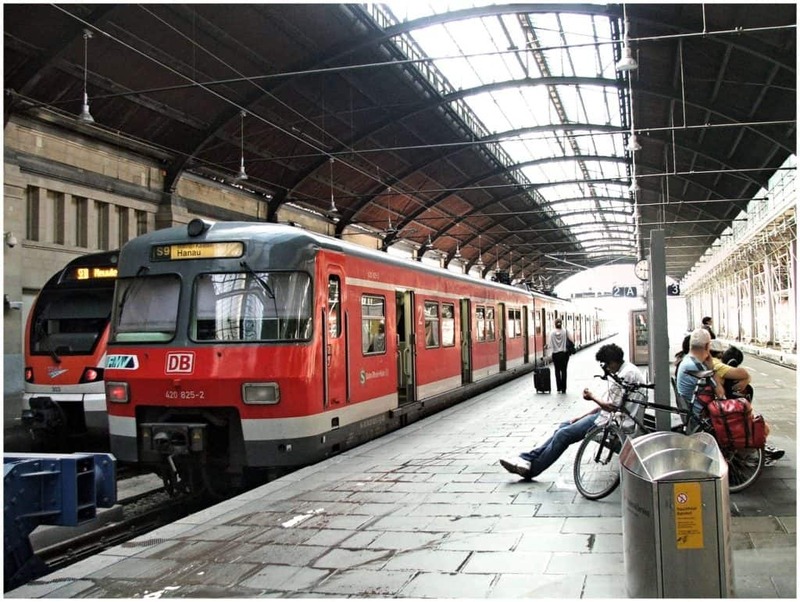 For the best train ticket prices book your ticket in well in advance through Deutsche Bahn. Note: if you pre-purchase your ticket at the lowest price you have to take the train you booked. If you miss that train, you have to buy another ticket. If you don’t mind taking slower regional trains you can get some really cheap group tickets. You may not want to use these tickets to go from, say Munich to Hamburg, but they’re great for day trips. Busses are often less expensive than the train (though not quite as comfortable and often slower). There are Eurail options for Germany, and they’re a great choice if you value flexibility over price. If you plan to rely on public transportation in the cities you visit, buy a day pass (or perhaps a multi-day or week pass) rather than individual tickets. Also check to see if there are group day tickets or if young kids can ride free. Note: there’s often a small additional fee to bring a bike or a large amount of luggage on public transportation. When I’m in Germany I typically opt for AirBnB (I like having a kitchen) or a smaller family-run Pension or boutique hotel. I used to stay in hostels when I was younger (they’re pretty nice in Germany) but even then I found Pensionen to be very affordable – sometimes more affordable than hostels – when traveling with one or two other people. Breakfast is often included with lodging in Germany (but not always). Sometimes breakfast is comprised of bread or Brötchen (delicious German rolls), cold cuts and cheese, butter and jam, tea and coffee. Other times the buffets will be more extensive with yogurt, cereal, a variety of breads, and even eggs. If you’re looking to save money on lodging, book rooms with a shared bathroom. Sometimes that will mean you’ll share a full bathroom with other guests on your floor, and other times you’ll have a sink and/or shower in your room and will share a toilet located in the hallway. Shared bathrooms are more common in smaller Pensionen. These days I prefer the convenience of having a full bathroom in my room but I’m not averse to sharing a hall bathroom when needed (takes me back to my younger backpacking days – ha!). I’ve never had to wait to use a shared bathroom or had any trouble with them. Sometimes there are two or more bathrooms per floor. If you do opt for a shared bathroom, bring flip-flops! Hostels can be a great option for families, as many offer family rooms. Hostels typically offer a simple breakfast and sometimes also offer dinner. While accommodations are simple, some hostels can be in spectacular locations. The hostel in Bacharach, for example, is in an old castle on a hill and offers a gorgeous view of the town below and the Rhine river! Click here to check out the best deals on hotels and holiday rentals in Germany! Check out my packing list for Germany! Layer, layer, layer! As I mentioned above, the weather in Germany is often unpredictable so your best bet is to bring layers so you can customize your wardrobe on the fly. Since rain is a possibility any time of year, you may want to bring a light rain jacket or an umbrella. Bring comfortable shoes. You’ll no doubt walk all day long (often on cobblestone streets), so bring your most comfortable, supportive shoes. Be sure to break in your shoes before you travel. There’s nothing worse than realizing a day into your trip that your shoes pinch your toes or give you huge blisters. (Bring along moleskin, just in case. I always have this kind in my day bag!) I typically bring a good pair of walking shoes appropriate for the season (boots in the winter) and a nicer, dressier pair of flats (sandals in the summer). You can wear jeans. Some people say never travel with jeans but I’m not one of those people. I love traveling with jeans! They’re comfortable, I can wear them a few times without having to wash them, and I feel less like a tourist wearing them because everyone wears them. If you like jeans, wear jeans. Scarf, hat, gloves. If you’re traveling in the winter or even late fall or early spring, definitely bring a warm scarf, hat, and gloves or mittens. Or buy them in Germany and take them home as a souvenir! Almost all of my winter accessories are from Germany. Even if you’re not traveling in colder weather, I recommend a travel scarf with a hidden pocket for ease and security! You can wear shorts in the summer. Sure, shorts aren’t as popular as they are in the US but if you like them and are comfortable in them, wear them. That said, most women wear dresses or skirts in the summer and men will often wear light pants. Capri pants were quite popular for both men and women at one point. Click here to read my guide to buying the best travel purse. Merino wool camisole – These camisoles are the BEST for travel! They’re soft, comfortable, easy to hand wash, and they never stink. This might be TMI but a few years ago, when I was traveling solo, I wore the same moreno wool camisole each day for 14 days in warm spring weather. It never smelled bad! Since that experiment I don’t typically go that long without washing my camisoles, but I like knowing that I could! Click here to read more reviews and buy a merino wool camisole. Foldable flats – I splurged on a pair of Tieks a few years ago, and even after I took them on a trip to Munich and Stuttgart I wasn’t convinced. But after I broke them in I started really liking them. I wouldn’t recommend them for a full day of walking (especially on cobblestones) but I like to bring my Tieks along for a change of pace or when I want the option of wearing a cute pair of flats but don’t want them to take up much space in my suitcase. I have the basic black flats but they do come in a wide variety of cute colors and patterns. If you’re not interested in Tieks, you’ll find a lot of similar foldable flats on Amazon for a lot less. Click here to check out foldable flats on Amazon. Merino wool shoes – I bought a pair of dark grey merino wool walking/tennis shoes a couple years ago and I LOVE them! I can wear them barefoot in the summer, and not only do my feet stay relatively cool, my shoes don’t stink when I take them off at the end of the day. I can throw them in the wash if they get dirty (though mine still look great 2 years later), they pack flat and don’t take up much space in my suitcase or travel backpack, and the heel is thick and cushioned. You can also buy replacement merino wool insoles without having to buy a new pair of shoes. What I don’t like: not enough arch support for me and not enough padding under the ball of my foot. To be honest, I didn’t like them at first. I bought a pair just before a trip to Hamburg and didn’t have enough time to break them in. The first few times I wore them they were very uncomfortable after wearing them all day and I was super disappointed! But after adding an arch support and a gel insert under the ball of my foot (I like this one) I started liking them better. I now LOVE them and wear them all the time while traveling and at home! Click here to to read reviews and check out merino wool shoes. Disclaimer: The International Desserts Blog is a participant in the Amazon Services LLC Associates Program, an affiliate advertising program designed to provide a means for us to earn fees by linking to Amazon.com and affiliated sites. Thank you for supporting my site and helping me make it the best international desserts and travel resource on the internet!